When it comes to toiletry shopping, I have to admit I don't normally spend that much. Whenever I do need something I will go and buy it and maybe get one or two items extra but when I went shopping today, I did go a little over the top. I initially went in to get a new foundation but I walked out after spending nearly £40! First off I headed to the makeup counters and picked myself up the Rimmel Wake Me Up foundation. I loved Rimmel's Stay Matte foundation so much and I was gutted to see it was starting to run a little dry but I'd read a few good reviews about the Wake Me Up foundation so why not? Next up was the MUA stand. I did a review on the MUA Luxe Lip Lacquers a few months ago and I was super excited to see that they'd brought out 4 new shades, two neutral browns and two pinks. Since they were only £3, it would be stupid not to pick all four up! I did also pick up a cheeky £1 Matte lipstick in one of their two new shades, Fawn Fancy. I now cannot move for lipsticks. After moving away from the makeup counters, I then went on to the hair aisles. When it comes to shampoo and conditioner, I wouldn't necessarily say I have a favourite or a brand I always go to. The only thing I do look for is products that are for colour/damaged hair or maybe even something for volume if I'm feeling a bit fancy! This time the new Garnier Ultimate Blends Shampoo and Conditioner caught my eye with their big colourful bottles which slightly remind me of taller versions of the Organix bottles. Anybody else? Nope, just me. The main thing that caught my eye about these bottles in particular was that they're specially for mid-long hair with split ends. Now I know theres no magic cure for split ends but products that give your hair a good conditioning treatment make all the difference. Next on my list was me going a little bit wild. Recently I've been wanting my ombre hair back but to also go a little bit lighter for the summer. 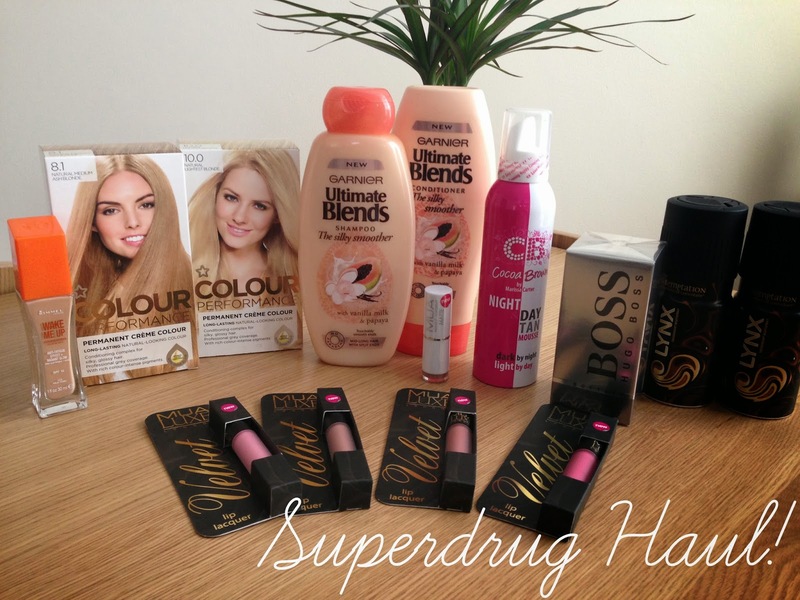 The Superdrug colour performance dyes were buy one get one half price which is great because I end up needing more because I've got long hair. I picked two different colours because I obviously want my ends lighter so fingers crossed when I come to do it, it looks good! The next wild thing I brought was the Cocoa Brown Night & Day Tan Mousse. I was getting a little jealous of seeing everybody go on holiday and coming back with gorgeous tans so what do you do when you can't afford a holiday? You fake a tan! I'd read a few reviews on the Cocoa Brown brand beforehand and a lot of people recommended it as it wasn't the usual orange tan so hopefully after using it I'll be looking like I've spent two weeks in the Caribbean! I obviously went a little mad but they're all products I'll use and I will even get a few review posts out of them so that's a positive, right?